How does a literary historian end up thinking in terms of z-scores, principal component analysis, and clustering coefficients? 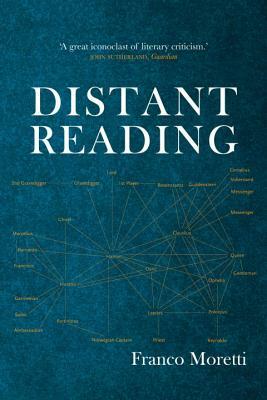 The essays in "Distant Reading" led to a new and often contested paradigm of literary analysis. In presenting them here Franco Moretti reconstructs his intellectual trajectory, the theoretical influences over his work, and explores the polemics that have often developed around his positions. From the evolutionary model of "Modern European Literature," through the geo-cultural insights of "Conjectures of World Literature" and "Planet Hollywood," to the quantitative findings of "Style, inc." and the abstract patterns of "Network Theory, Plot Analysis," the book follows two decades of conceptual development, organizing them around the metaphor of "distant reading," that has come to define--well beyond the wildest expectations of its author--a growing field of unorthodox literary studies. Franco Moretti teaches English and Comparative Literature at Columbia University. He is the author of "Signs Taken for Wonders," "The Way of the World" and "Modern Epic," all from Verso.